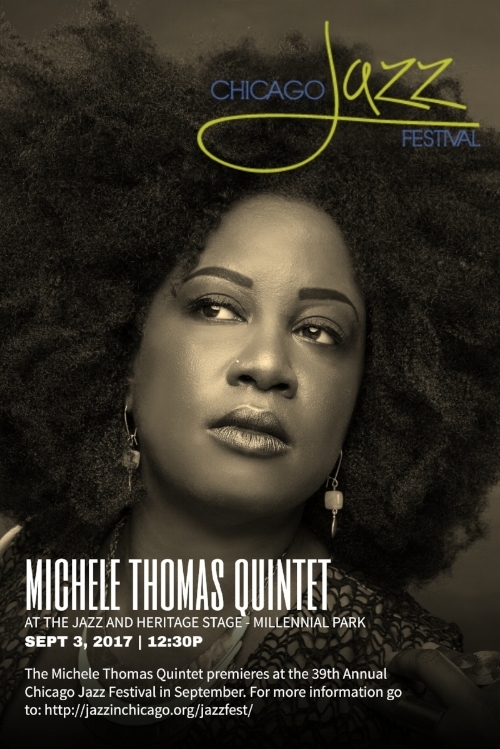 I can't wait to see you this coming Sunday at the Chicago Jazz Festival! I am so excited to perform for all of Chicago and especially my community! "The daughter of a preacher, Chicago singer Michele Thomas brings an irresistible gospel-soul warmth to jazz. And, as she demonstrates with her Stevie Wonder covers Messenger, her 2012 album, she applies a sophisticated jazz sensibility to gospel and soul. Messenger was so-named in recognition of her subject’s outspoken message songs, including “Higher Ground,” to which she brings a timely anger. “His music not only brings spirits up, but makes you think about what’s going on in the world around you,” she said. For Thomas, that world extends to Sweden, where she taught and performed gospel. Her band SoulMeme features two longtime friends and cohorts in guitarist Neal Alger and drummer Darren Scorza, with whom she cut her teeth as a performer in places like Big Joe’s 2 & 6 Pub in Ravenswood Manor. They will be joined today by pianist Matt Nelson and the immaculate bassist Clark Sommers."